Floating in the darkness on a pool of cerulean blue, the silver lotus emerges on the horizon as though its twelve luminous petals were reaching for twelve stars. Possessing an aura both regal and fierce, light flows through and around every facet of her body, and you approach with a caution reserved for a mystical being. She seems to inhabit two worlds of radiance at once, both emanating from the center of her form. Resembling beams streaming through deep water, light shines from underneath her where there should be shadow, creating an otherworldly azure blue projection of the sacred symbol of the Flower of Life on the surface of the parched earth. She seems to be watching over this ancient emblem of the blueprint of creation, yet in the same moment, offering it to the desert wanderer as a meditation on her fundamental nature. Gazing upwards you notice that her leaves that reach downward will also guide you upward, and slowly you begin your ascent into a new dimension of light. Enveloped by twelve arcing silver petals, you recline in her bower of protection and discover other beings in her embrace. United in this sacred space you are illuminated by the glow of a giant seedpod, and surrounded by carvings of a mysterious Goddess figure who reaches upward to offer a reflective orb of radiant energy to the sky. She is the Sacred Lotus of ancient creation myth and the avatar of enlightenment. She is the Life Force of all that is struggling to survive on this dying planet. She is the Guardian of Eden. Guardian of Eden frames our current ecological crisis within the petals of the Sacred Lotus flower—the mythological seat of creation and the symbol of enlightenment. In Hindu creation mythology, a new era of time is created after a lotus flower blooms. As a meditation on our own era of time, this steel lotus flower blooms before us as a physical reflection of the fierceness and beauty of our planet under threat. She is the guardian of the Eden that once was. To climb the sculpture and lie in her petals offers an opportunity to meditate on the consciousness of our natural world. At night, the entire flower radiates light. A curved mirrored seed pod illuminates the upper petals, and below, the ancient Egyptian "Flower of Life" symbol radiates downward from the heart of the lotus, it’s interlocking circles representing the ancient "Life Force Code" of creation. Among the intricately carved lotus petals high above the earth, each visitor becomes the symbolic embodiment of the lotus’s pollen: the vital ecological information carriers of every flower. By the cross-pollination of our ideas, our energy and our creativity, we spread them throughout humanity, furthering the existence of our own species. Guardian of Eden is a gathering space for us to consider our role in this turbulent age and to recognize that Earth’s survival is intimately connected to our own. It is up to us to define what this new era of time will be. It is we who are the Guardians of Eden. 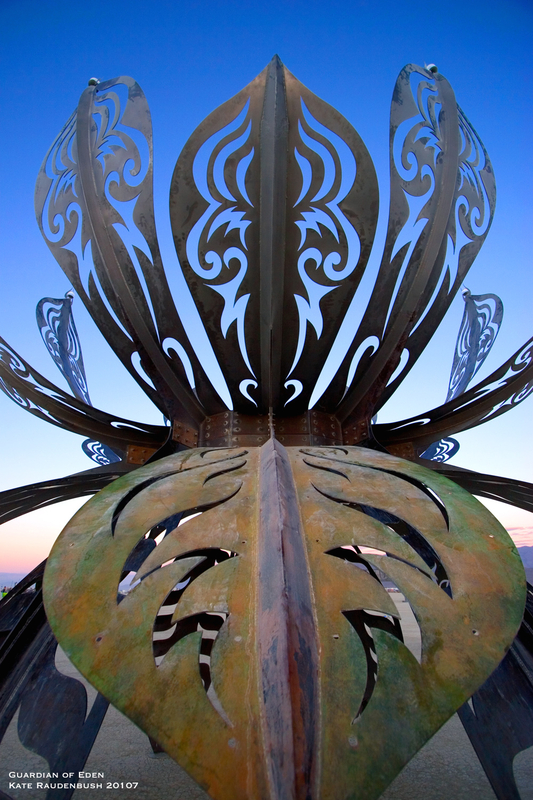 Like no year before it, 2007s Burning Man theme is compelling on multiple levels. The Green Man is not only an over-arching creative theme, it is a rallying cry, a call to action like never before. Tellingly, anthropologist Margaret Mead declared, ”never doubt that a small group of dedicated individuals can change the world. In fact, it’s the only thing that ever has.” At its core, I believe this spirit inhabits the mission statement of Burning Man itself. It has always been catalyst for change. This year The Green Man is an evolutionary leap in Burning Man’s message, and in its sphere of influence: this year’s theme of ecological awareness is an unparalleled opportunity to teach, enlighten and inspire to action tens of thousands of people to a new awareness of the personal stake we each have in the sustainability and harmony of our existence on this planet. The Guardian of Eden takes as it’s inspiration a cross pollination of Hindu and Egyptian creation myth, Buddhist symbolism and the ancient symbol of the Flower Of Life. According to Hindu culture, within each sentient being on earth is contained the spirit of the sacred Lotus, the symbol of Creation. It is said that in the primordial waters before time existed, the god Vishnu lay in meditation with the goddess Lakshimi on a bed of eternity, manifested by a coiled 100 headed snake, Anata-Shesha, who represented the accumulated karma from the last cycle of life. As he meditated, his life force energy came forth from his navel in the shape of a delicate lotus flower. When her petals opened they reveled the god Brahman who, at Vishnu’s command, brought forth order and orchestrated the birth of the world. This act of creation marks the beginning of each new epoch of existence. According to this conception of time, it is interesting to note that today, we are nearing the end of the 4th final age, the Kaliyurga, an age of natural disaster, poverty and corruption, and, at its culmination, Vishnu returns, destroys everything and starts the cycle of creation anew. The Guardian of Eden projects her essence at night in a dramatic illusion of light filtering through water, illuminating the surface of our dry lake bed, the playa. This blue projection of the Flower of Life is one of the key underlying elements of the inspiration for this sculpture, and has been called by many to be the “blue print of creation.” It is an ancient sacred geometric symbol found across diverse cultures since antiquity. its a metaphor that illustrates the interconnectedness of all creation in the universe. This interlocking circular design contains the proportional templates for the 5 platonic solids: the three-dimensional building blocks for matter from the five convex regular polyhedra in existence. These 5 shapes were theorized to create all the possible structures of organic life, minerals, sound, music and language, and their interlocking combinations are theorized to illustrate structure of chemical bonds in the periodic table. In this way, the interlocking circles of the Flower of Life conjures the process of embryonic cell division in every living creature. The knowledge of this ancient sacred symbol can be traced back to its appearance on a temple that was discovered 4,500 years ago by King Seti I, in Abydos, Egypt. The ancient temple he discovered then had been built almost 10,500 years ago to commemorate Osiris, the god of death and regeneration. 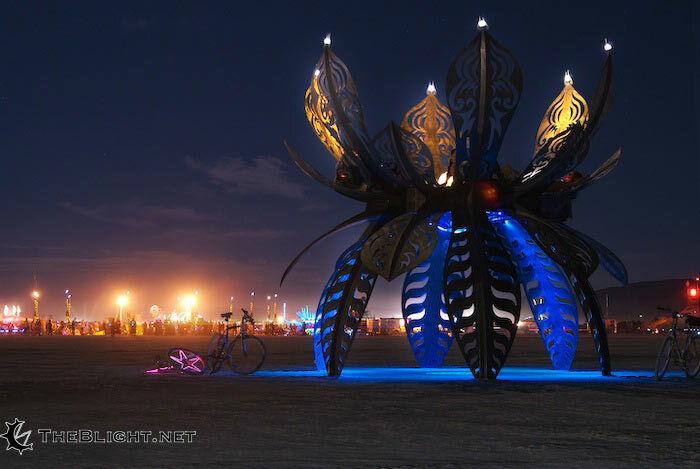 Looking from this past history, I imagine the Guardian of Eden to incarnate a representation of rebirth into the next evolutionary era of Burning Man as a transformational, creative force in which we all take part.